Three months after the Communist mayor of a Paris suburb, Valenton, named a street, Barghouti Alley, after a convicted Palestinian terrorist, another municipality of a second Paris suburb has honored the same man. 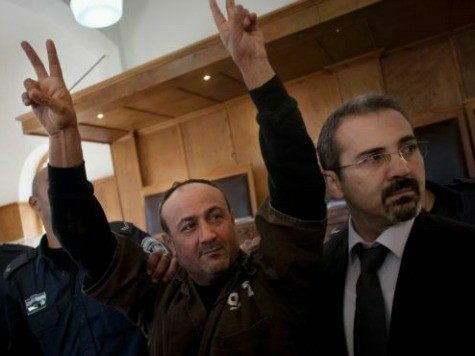 Marwan Barghouti, serving multiple life sentences in Israel, is a Palestinian Fatah faction leader and is regarded as one of the leaders of the First and Second Intifadas, which resulted in the loss of thousands of innocent Israeli lives. On December 22, Barghouti was named an honorary citizen of Aubervilliers, according to the Jewish Telegraphic Agency. In an attempt to justify Barghouti’s terrorist acts, France placed him in the same category as the late South African leader Nelson Mandela. The city of Aubervilliers said in a statement that the move was part of its commitment to support what it described as political prisoners, the JTA notes. “Nelson Mandela, whom you have the audacity of referencing, was indeed a political activist sentenced to prison, but for his opinions – not his actions,” wrote Roger Cukierman. Cukierman is the president of the CRIF (Conseil Représentatif des Institutions Juives de France), which serves as the umbrella organization for French Jewish organizations. Two days after the second honoring of the terrorist, Cukierman reportedly wrote a letter to Pascal Beaudet, Communist mayor of Aubervilliers, requesting he rescind the act. The JTA notes that a legal fight is brewing between the National Bureau for Vigilance Against Anti-Semitism (BNVCA) and the suburb of Valenton over the dedication of Barghouti Alley. The BNVCA suggests that dedicating the street to a known terrorist is an incitement to and endorsement of violence, particularly at a time when the prevalence of anti-Semitic crimes is on the rise. France is known internationally for its anti-Semitic rhetoric and positioning. Adelle Nazarian is on Twitter @AdelleNaz.